Then backup the registry by right-clicking the Computer icon in the upper left pane and choosing Export. If you end up flubbing the registry during this tutorial then you can restore it by importing the saved .REG file you just exported. Make sure you save the file to a removable drive or use cloud storage because if you have a hapless encounter with the Registry the last thing you want to do is find yourself scrambling to find the backup. Double-click OEMBackground, change the value to 1 and click OK. 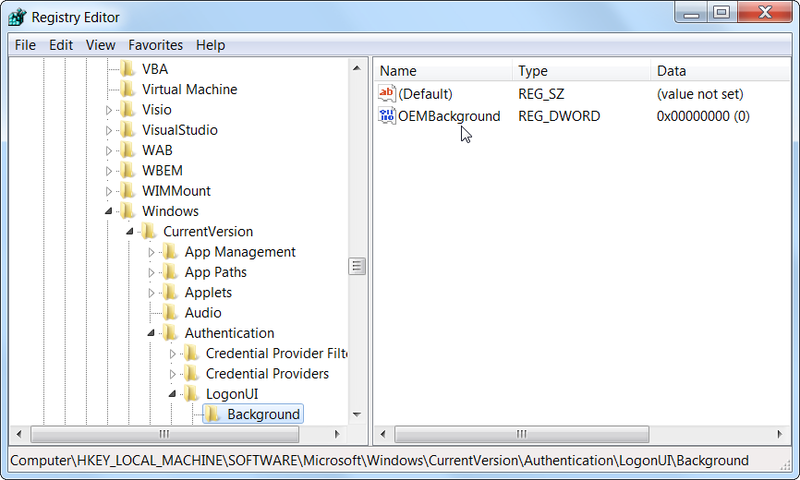 If for some reason you don’t see that OEMBackground key, right click an empty part of the Registry editor and mouse over to New and left click DWORD (32-bit Value). Name the keyOEMBackground, double click it and set the value to 1. The first rule is that the image has to be less than 256KB and should match your screen resolution so that the image doesn’t look stretched or squished. You can find some decent images by doing a quick Google Images search for windows 7 logon screens gallery or checkoutInterfaceLift’s selection. Once you have background image we need to move it to the folder Windows is expecting to find it. In the OOBE folder create a new folder and name it info. Then double-click that and create a new folder inside of info named backgrounds. So make sure you rename accordingly. After you place your little graphic here, lock the screen by pressing the Windows Key + L.
You should immediately see your custom image background now. Are you sure the image is less than 256KBs? Also you renamed the image to backgroundDefault.jpg and it lives in C:\Windows\System32\oobe\info\backgrounds right? And keep in mind if you change your theme it will erase the Registry tweak we made earlier.